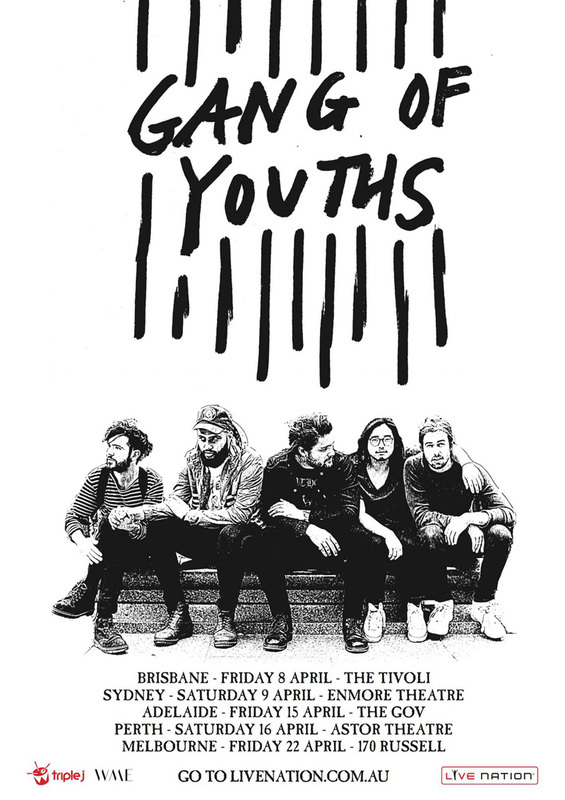 ​After a highly successful 26-date album release tour, Sydney rockers Gang of Youths are set to embark on their most ambitious run of shows to date, announcing a national Australian headline tour for April 2016. 2015 has been an incredible year for Gang Of Youths; a year that has seen them triumphant over the Australian music scene with their critically acclaimed debut release The Positions. Earning countless glowing reviews from industry heavyweights Rolling Stone, Stereogum and The Guardian, scoring the coveted triple j feature album and debuting top five in the ARIA chart on release, the success of their debut album has catapulted Gang Of Youths to the top of this year’s crop of exciting new Australian artists. The band have also been nominated for Album Of The Year in this year’s prestigious J Awards and have notched up an impressive five ARIA Awards nominations, including Breakthrough Artist, Best Rock Album and Best Australian Live Act. With a string of sold out tours in 2015 solidifying their reputation as one of the country’s hardest working touring bands, Gang Of Youths documented their travels on the recently released visual diary of life on the road Restraint & Release. You can watch it HERE.